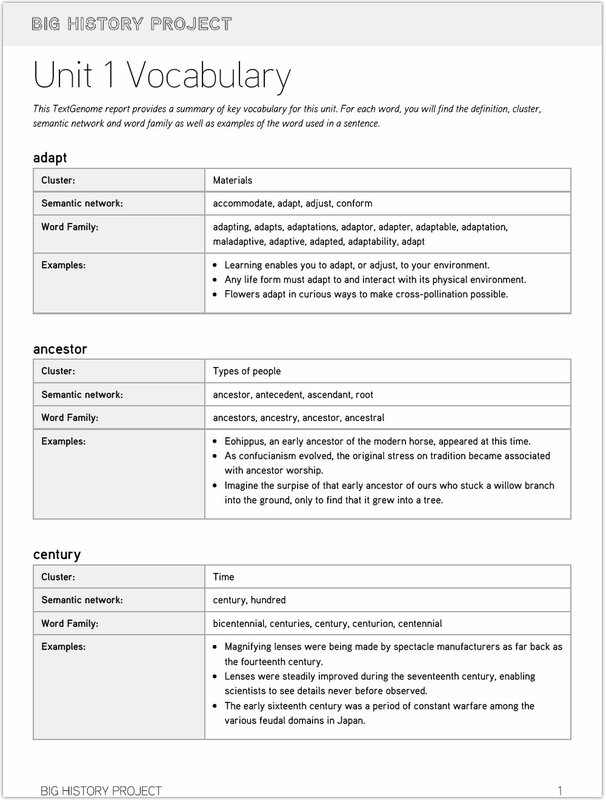 With this year’s update, the Big History Project teamed up with Text Genome to revise the course glossary and the related vocabulary activities, and to provide supporting Text Genome reports for many articles and videos throughout the course. We wanted to improve the literacy supports within the course and respond to teacher feedback about our vocab activities. 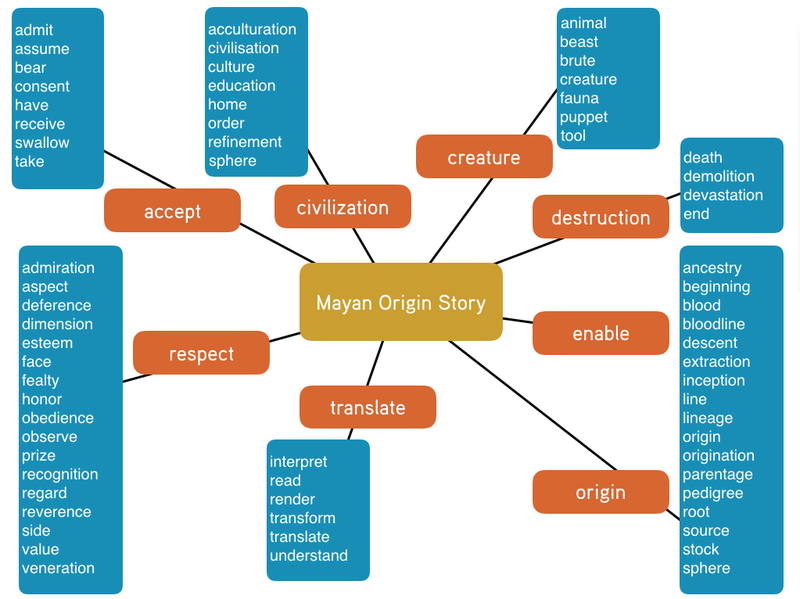 To help understand how to use the Text Genome reports and the new activities, we wrote up a scenario of how a fictional teacher might use the resources. Amanda teaches Big History for eighth graders at Corteleone Middle School in Ho-Ho-Kus, New Jersey. Helping her kids become better writers is a big focus for Amanda. At the beginning of each unit, Amanda downloads the unit vocabulary guide. This guide calls out the key vocabulary her students will encounter in the readings and videos for that unit. Each word is put in the context of its morphological family and semantic (conceptual) network, and examples of the word used in various sentences are provided. Sample visualization of a semantic network. NOTE: There are no definitions given for vocabulary words included in the report. If you want the definitions, they’re available in the glossary, as always, but they don’t appear in unit guides or the individual Text Genome reports. We’ve done this intentionally. Rather than simply memorizing a definition, we want students to understand the concept a word represents. So, the emphasis is placed on the structure of the language around each word rather than its simple definition. Amanda asks her students to review the list and to call out words that are unfamiliar, or words they think they should know (but do not). For each, she focuses on the related words and has the students look at the examples provided. She knows that simply memorizing a definition isn’t helpful; it’s important for students to become familiar with the use of the word in context and the concept it represents. Next, Amanda asks students to look at the vocabulary activities. In Big History, there are two set of activities for each unit. Each activity has two types of questions. The first question type is a fairly simple fill-in-the-blank question. The goal here is to help students become familiar with the words in context and to give them a sense of how comfortable they are with the words. Use one of the given choices to fill in the blank. Our solar system is part of a vast __________________________. In the second type of question, students complete a set of multiple choice questions to revisit these same words. What does the word universe mean? Once the students have completed the first vocabulary activity for the unit, Amanda leads a quick discussion with students about any particularly challenging or unfamiliar terms. Later in the unit, usually the third lesson, the conversation and the questions are a bit different. At this point, students have seen all (or nearly all) of the words in the unit vocabulary. They have seen them in the texts and they should have completed the first couple of exercises in the unit, which provide context for each word. Now, it’s time to formalize their understanding by looking at different forms of the words (morphology) and related words (semantic network). Before beginning the activity, Amanda takes a moment to review the vocabulary with the class for a second time. She asks the students to pick out words that are still unfamiliar, or words that gave them trouble in a readings or video. This time, she points them to the semantic networks and asks them how each of the vocabulary words differs from the other words in its semantic network. The goal at this stage is to push a deeper understanding of the concept. Next, Amanda asks students to look at the first type of question in this activity. This one takes the simple fill-in-the-blank question from Part I and focuses on getting familiar with all of the different variations on the word that they encountered in the unit’s readings or videos. It’s certainly a more challenging activity than the simple one-word exercises that they have saw in Part I, but because the list of words is finite and the words are related, deciding which one goes where gives the learners a chance to see how words in a family are related and how different forms are used in different grammatical settings. The second type of question in this activity is a matching exercise that focuses on the semantic network of each word. It asks students to find synonyms for the key words. Again, engaging readers in choosing what goes with what lets them get a better sense not only of the boundaries on the meaning of the word but its neighbors as well. Amanda wraps up the vocabulary activities for the unit with a quick discussion about any particularly challenging or unfamiliar terms. She reminds students that whenever they come across an unfamiliar word, they can review the same information in the glossary or the Text Genome report.